There may come a time when it is not safe for you to live alone. For whatever reason you cannot live with family members, we provide you with a comfortable and safe place to reside. Additionally, we make sure that you receive the nursing care you need to maintain your level of health. 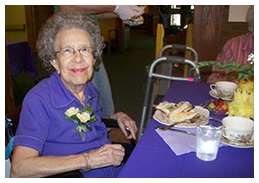 Our staff provides the best residential care for the elderly in Aurora, IL. We care for elders with memory problems, ones who are in need of medication reminders and many more at our senior amenities. Come to us when you need senior assisted living. The Jennings Terrace Nursing Center is dedicated to meeting the medical, personal and social needs of seniors who can no longer completely care for themselves. Our 60-bed nursing and health care facility offers long-term nursing care services and care for residents with memory problems. Each resident is encouraged to regain or maintain their individual level of independence through rehabilitation or long-term support. Our staff of professional Registered Nurses, Licensed Practical Nurses, and Certified Nurse Aides (CNAs) provides 24-hour nursing care services under the direction of the resident's physician. Additionally, room accommodations and facility amenities create a safe, comfortable setting for our residents and their visitors. Residents are served 3 home-style prepared meals daily, and guests may join residents for a meal at any time. Just consult with the nurse. Our Restorative Department that serves residents at no additional charge develops individual rehabilitation and restorative programs based on diagnosis and prognosis. Social Services help identify the appropriate stimuli for residents to achieve their highest psychosocial level, and counsel families on supportive resident care. The Activity Department engages residents in programs that stimulate the body, mind, and spirit. We also have standing partnerships with local doctors, laboratories, pharmaceutical services, medical supply companies, rehabilitation services, and hospice care. We welcome you to visit us to experience our extraordinary care and compare our exceptional rates. Residents will enjoy a range of amenities meant to ensure safety, comfort, security, socialization, and healthy well-being. We can adjust our assisted living services to meet an individual's needs, instead of our seniors having to adapt to limited available services. For housing, we have a choice of room accommodations to fit your lifestyle and budget, including a special rate for veterans. You can relax and not worry about fixing meals or managing a household when you reside with us. Our staff takes pride in providing the highest standard of residential care for the elderly. At our comfortable facility, residents receive individual attention from compassionate, highly trained nurses. We maintain an environment that promotes general wellness by providing social activities, rehabilitative support, and medical care. It’s important to us to create a positive setting that feels like home, and our residents enjoy the friendly interactions, healthy meals, and tranquil atmosphere. As a non-profit nursing home that strives to keep our rates as affordable as possible, we welcome grants from caring individuals and organizations. We offer single room and two-room accommodations with shared and private bath options. Residents can choose between three levels of supportive care based on their assessed needs. Additional options include medication assistance and an emergency call pendent. Nursing care is also available in semi-private or private rooms, as well as respite services for short-term stays. For off-site appointments, we offer a courtesy van with wheelchair lift. We always encourage our residents to invite family and guests for meals. If you are interested in our program, please don’t hesitate to call and ask for a tour of the premises. We welcome every opportunity to assist our seniors and help them maintain a high quality of life with our elder care services. Contact us with any questions about our services. 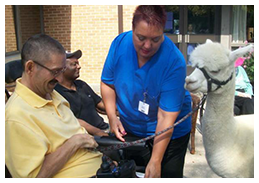 We care for the elderly at our facility in Aurora, Illinois.